Plant Disease Research Department, Iranian Research Institute of Plant Protection, Tehran, Iran. *To whom correspondence should be addressed. E-mail: sspashena@gmail.com. Received 28 May, 2018; Received in revised form 06 August, 2018; Accepted 09 August, 2018. Rhizosphere refers to the environment influenced by plant roots in which elevated microbial activity is observed. Plant growth promoting rhizobacteria (PGPRs), which are adapted to this ecosystem, increase plant health and productivity based on integrated plant-bacteria systems. 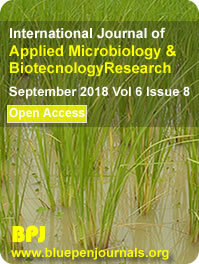 Since the condition of microbial combination is altered by root exudates, isolated bacteria, including Pseudomonas fluorescens UTSP50, Bacillus subtilis UTSP40, Pseudomonas mosselii UTSP6 and Ochrobactrum anthropi UTSP24, triggered growth in two varieties of rice, differently. To probe how the isolated bacteria affect rice growth, phosphate solubilizing and auxin production abilities were examined in vitro and phyto chamber conditions. P. fluorescens UTSP50 and P. mosselii UTSP6 showed phosphate solubilizing activity on Pikovskaya's agar medium. P. mosselii UTSP6 and O. anthropi UTSP24 in vitro and, almost, all the tested bacteria in transgenic DR5::GUS rice plants, were found to produce auxin and/or alter auxin maxima. This may indicate the hypothesis that rhizosphere is necessary to produce indole acetic acid (IAA) by beneficial bacteria or the presence of PGPRs regulates transportation and gradients of auxin in plants.